It’s the Napoleonic Wars with Dragons! When I saw this book on a list of best steampunk novels, I remembered that I’d seen its author, Naomi Novik, on a panel at Phoenix Comicon a few years back. She’d talked about her book series which featured “the Napoleonic Wars with dragons.” What a great idea! It may be a bit outside the normal parameters of steampunk, because it takes place before Victoria’s reign, in the early 1800’s, and its focus is more on biology than technology. So what? Though I focus mainly on the Victorian Age and the Gilded Era, I don’t ignore other historical periods. The premise of the book is that European history happens as it actually did happen, with one difference – dragons are real and relatively numerous. Humans can train them, and of course, they have military applications. There are several species, each of which has different capabilities. Some can breathe fire, others can spit acid, and still others are very fast. They have a few things in common, however – they hatch from eggs, they are warm-blooded, they can fly, and they can learn human speech. The story centers around a British naval captain, Willliam Laurence, whose ship captures a French vessel bearing a dragon egg intended to be a gift for Emperor Napoleon. The egg hatches before the Brits can reach land and find a qualified dragon handler. Quite by accident, the hatchling “impresses” upon Captain Laurence, causing a bond which can not be broken. This obliges him to leave the Navy and join the Air Corps, much to the consternation of his family, friends, and colleagues. He names the dragon Temeraire, after a famous British warship. 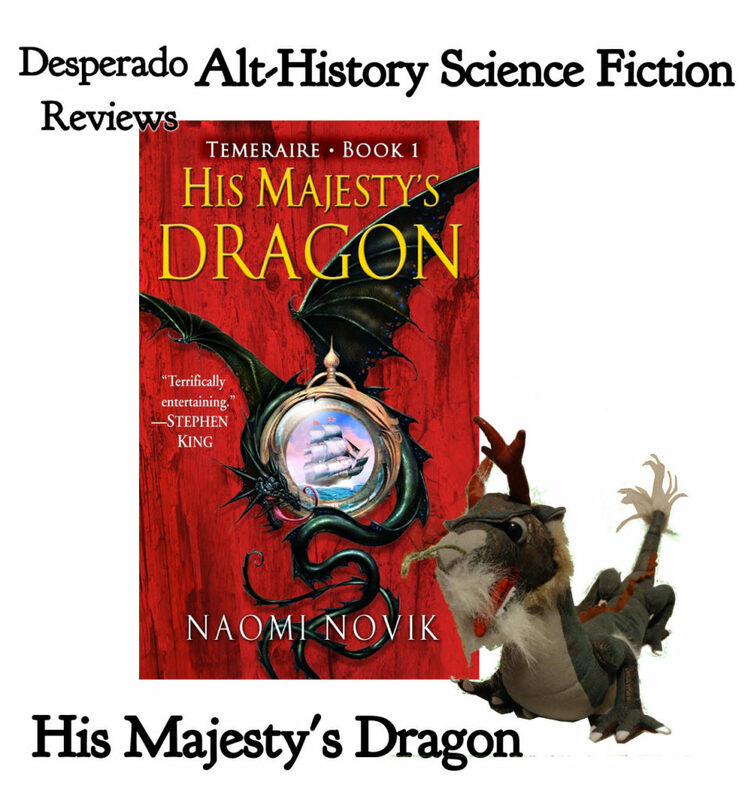 Temeraire is no ordinary dragon. He is a rare Chinese Imperial, and he learns to talk very quickly, even for a dragon. Laurence discovers that being in the Air Corps is both a blessing and the curse. Corpsmen are privileged because they are critical to the war effort, but it’s a lifetime obligation. Because they must live with their dragons they are separated from normal human society. Laurence’s parents had expected him to marry and carry on the family name, which is now impossible. His father practically disowns him. For a while, he curses his bad fortune but soon forms a close bond with Temeraire, who is as intelligent as a human if not more so. He faces numerous challenges as an outsider in the close-knit Air Corps, most of whom become trainees at 10 or 12 years old. Not only must prove himself, he must also train his very young dragon for the upcoming war with France. Novick has obviously done her homework on the period, regarding both civilian customs and military life. The addition of dragons introduces some interesting changes to conservative British society, particularly since some breeds of dragons will only accept female trainers. This gives the Air Corps an egalitarian culture that seems quite anachronistic. On the other hand, it’s still a 19th Century military with all that entails including harsh discipline and the execution of deserters and spies. The book won a Compton Crook award (fantasy/sci-fi) in 2007 and was nominated for a Hugo for best novel that same year. The story is quite engaging, though it didn’t make it into my personal top ten. It bogs down a bit in the middle as Laurence and Temeraire adjust to life in the Corps. Furthermore, Laurence seems a bit more sentimental for a military man. It seems jarring to hear him address his ten-ton dragon as “my dear.” However, these issues are rather minor quibbles. His Majesty’s Dragon may not be steampunk in the stereotyped “gears and goggles” vein, but I enjoyed it nevertheless. It’s a fine example of historical fantasy with an authentic period feel and lots of action. It’s fairly accessible and because it features dragons, I highly recommend it as a “gateway drug” to those new to the genre. I give it a rating of 4 out of 5 gears.